The Reef Villa is tricked out with everything you could want on a vacation: water sports equipment, a boat dock, and a spa. Three levels of living space gives everyone their own area to relax and enjoy the wide-spanning ocean view. You can look out any window and see the ocean. On top of that, Maho is a few minutes away, and has several other activities and luxuries if you want to explore the island. Fun house in a great location near island activities! 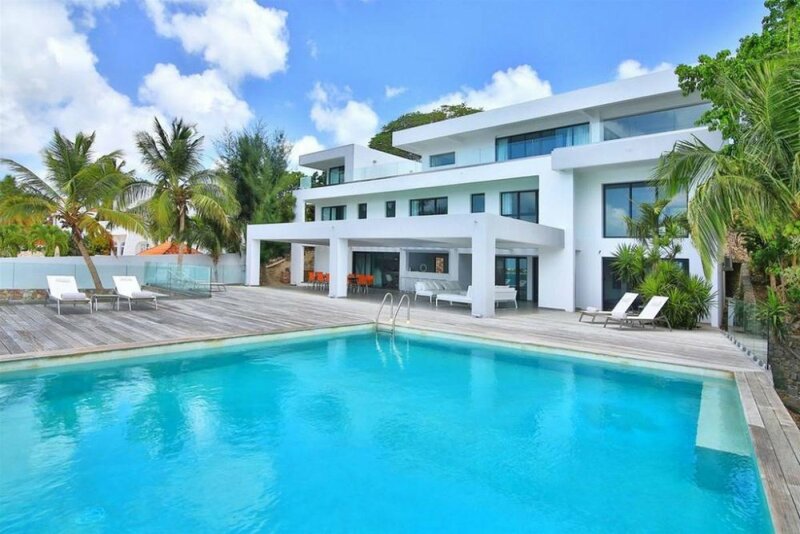 The Reef is a waterfront villa on the Dutch side of St. Maarten. The villa’s three levels of waterfront property offer panoramic ocean views and modern design. The villa is a short 5 minute drive to the Maho Reef area, which offers restaurants, shopping, casinos, and nightlife. The villa has a private boat dock on Simpson Bay Lagoon. The lounging terrace features outdoor living areas and an infinity edge, saltwater pool. A kayak, wake-board, and water skis are also available for guests to take out on the lagoon. Use the fire pit to reconnect with loved ones at the end of the day. An expansive veranda has an additional outdoor living area, and a Jacuzzi sits around the corner from the rest of the terrace. There’s also a fitness area, spa, and game room for guests to enjoy. The fitness area has a punching bag, stationary bike, treadmill, and weight equipment for any workout. The spa has a massage table, steam room, and showers for guaranteed relaxation. The game room has a ping-pong table, foosball, TV, and mini fridge, sure to keep guests occupied for hours. Inside, the villa’s ground floor holds the air-conditioned main area. The living room has satellite and cable TV, a DVD player, and a docking station. The kitchen is well-equipped with stainless steel appliances, an espresso machine, a coffee maker, and a wine cooler. The dining area is unique because of its ultra-modern, sleek design. It opens to the outdoor dining area and has an ocean view. A home cinema with eight theatre seats is the perfect spot for movie night—there’s even cupholders in the seats and dim lights for the full cinematic experience. The second floor houses the villa’s three bedroom suites, each with a king-sized bed and ensuite bathroom. The third floor holds the master suite, which has a king-sized bed, walk-in closet, and ensuite bath. The fifth bedroom is located in a separate apartment with its own entrance, ensuite bath, and private terrace. Each bedroom has satellite TV and air-conditioning.